United Yacht Sales New Jersey would love to guide you through a personal showing of this 51' Baltic 51 1985. This yacht for sale is located in Marion, Massachusetts and priced at $189,000. For a showing please contact us by filling out the form on this page and we will get back to you shortly! Forward stateroom with V-berth with new cushions (2014) and lots of additional storageabove and below. To starboard is a large hanging locker with shelves. To port is the forward head with shower. Next aft is the beautifully varnished teak main salon with new cushions, a very large dining table, comfortable seating for 6-8 persons and adjacent settee that includes book shelves and storage outboard and above. Dining table includes wine storage in center. Next aft to port is the large U-shaped galley with stainless double sinks and plenty of storage space. To starboard is the navigation station with bench seating. Aft of the Nav station is the second head. Aft of the head is the guest stateroom with over and under berths, hanging locker and seat. To port and aft of the galley is the walk- thru guest cabin, complete with upper and lower berths and hanging locker. 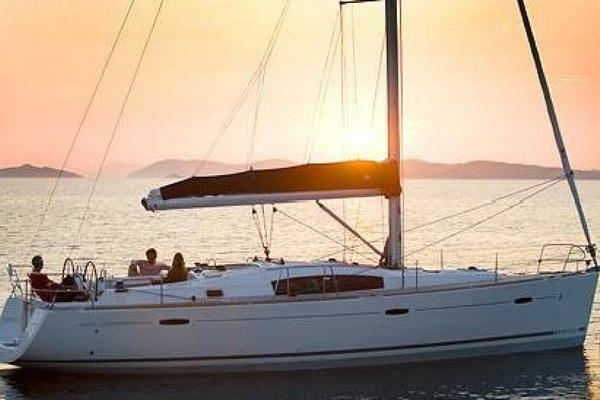 Next aft is the owner’s stateroom with centerline double (new mattress 2014), new seating to port and starboard, dressing table, two hanging lockers and private head and shower. Eberspacher forced hot air heat. New Max-Prop 3 blade, 2010. New Awlgripped hull and bottom in 2011. Hydraulically controlled bronze centerboard, draft 6’ with board up, 11' with board down. Centerboard sheaves and cable, 2010New Teak decks were replaced (glued) in 1994. Rub rails and hull ports installed by Hinckley. New steering pedestal assembly, cables, compass, shifter installed in 2011. Lofrans Falcon electric windlass with forward bow and cockpit controls. CQR plow anchor 75 lb. Hood Sea-Furl for inner forestay. Baltic Yachts are known around the world for their leading designs and quality finish. REUNITED is a fine example of the Baltic 51. She has been beautifully maintained and continually updated. Her extensive list of equipment and upgrades make her the complete package. She is awaiting her next owner.